A fresh set of Technical Projections and Select Comments are already available via the link in the right hand column, current through Wednesday’s US Close. And those are now very relevant to the near term price activity in equities that are done standing still since the end of last week. Other asset classes that have also had some reasonably strong swings. …and a reminder of why he is one of the most successful fund managers in history. In fact, that interview is split into two parts. 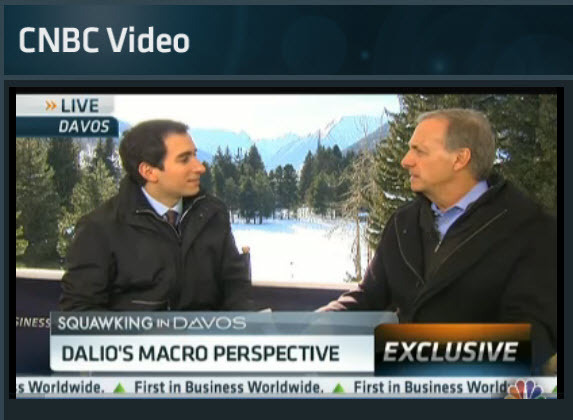 The first is Dalio’s Perspective on Deleveraging, followed by Dalio on Policy & Productivity. The first part is very explicit on the importance of the various aspects and approaches to the current major deleveraging cycle. There are also discussions of how the central banks are affecting markets and economies, and a reminder that trading is a zero sum game. The second section relates it all back to the current economic conditions, and even ends with a very brief individual country review. Enjoy the view. In the meantime, even though the markets took some interesting swings today, we feel the basic themes of stronger equities, challenged govvies and highly varied foreign exchange remain in place. The Weekly Report & Event Calendar is available through the link in the right hand column. This week’s Summary Perspective will be added sometime soon. Yet, in addition to the calendar are two key areas of interest we want to cover today: Japan and the degree to which the Equities psychology remains very positive in spite of some obvious headwinds. First of all, the combined Bank of Japan and Japanese government anti-deflation program announced today is as breathtaking in its scope as it is quirky in its implementation. If they are so committed to ensuring the inflation rate ramps up to 2.0%, why are they deferring the extended additional asset purchase program until the beginning of next year? We suppose there is quite a bit of anticipatory psychology they expect to accomplish their ends without actually doing anything in the near-term. Mr. Bernanke has shown how well that works on the Fed QE-Infinity program, so why wouldn’t Japan try it is well? Of course, the truly scary part is the degree to which they expect inflation to go from barely positive this year to something in the 3.0% area in 2014. That not only seems astounding as a prediction, but may well hold other risks to the Japanese government financing ability. They should be careful what they wish for. The bottom line is that in spite of this morning’s minor setback the bulls still own the trend unless and until the bears can get the market to Close back below last Thursday’s 1,470.70-1,465.60 gap higher. 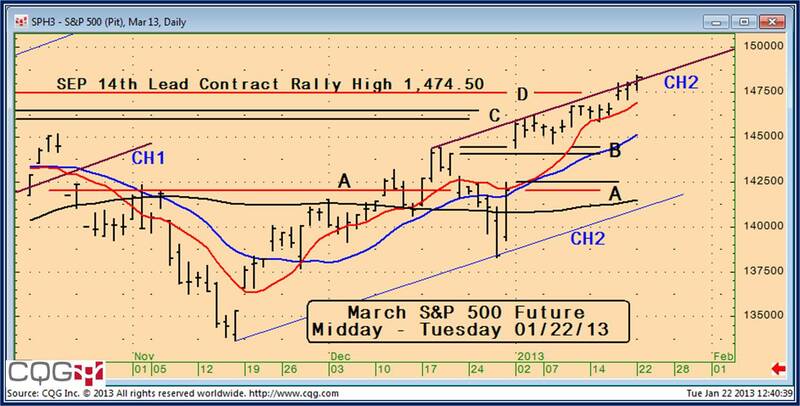 One of the key technical aspects that assisted Friday’s late session recovery was the inability of the bears to leverage the weak Michigan Sentiment number, as the March S&P 500 future held exactly at the 1,470.70 top of that gap. And in spite of our skepticism toward the equities across the first quarter, that all fits in very nicely with the broader technical projections allowing a move up to the low 1,500 area prior to the lead contract S&P 500 future being overbought once again. It is all about the confluence of factors we discussed in the previous Thursday’s (Jan. 10) Might US Equities Attempt a Jailbreak? post. Once the equities demonstrate that the bears will not likely be able to force a Close back below last Thursday’s 1,470.70-1,465.60 gap higher, the path of least resistance becomes up; at least until they hit the next significant threshold. © 2012 ROHR International, Inc. All International rights reserved. Happy Thanksgiving to all of our US readers, with thanks especially for the lack of any big time volatile swing in the wake of an ambush today. Let’s begin by allowing that there is typically only a marginal chance something will change radically on a surprise in one major financial center while another major center is closed for a holiday. That said, it has happened during some past instances. Tuesday’s Summary Perspective (available via the right hand column link) includes a brief discussion of how the US bond bears were ambushed in early November 2004. Back then the US bonds were under pressure near a critical low. Yet on the November 11th Veteran’s Day holiday (also a Thursday) the German Bund saw some very weak German news that extended its rally to a significant new high. That deferred a broader US bond selloff for four months. In the event this time around the potential for Chinese and Euro-zone Advance PMI’s released today was certainly a concern for the recent equities rally back from a significant selloff. Yet, in the event they were constructive enough to allow equities to advance the last several days’ bid. The weekly Report & Event Calendar along with the Weekly Summary Perspective are available through the links in the right hand column. The Perspective sums up what has been the anticipated reaction to the more cooperative tone of US Fiscal Cliff negotiations convened by the President at the end of last week. As was easy to surmise, both sides of the otherwise highly partisan US Congress were interested in appearing more reasonable. And then the equities were allowed to assume the best as Congress pulled that great European summer holiday trick: they left town. It could just as easily have been August in Europe instead of Thanksgiving in the US. That came along with somewhat better US data (especially housing) and funding for Greece, which was enough to bring in a very sharp equities relief rally yesterday. That sent the December S&P 500 future gapping up from last week’s test of 1,350 area back up to the 1,387 Tolerance of the 1,400 area overall congestion. And that is how the “worst case scenario” ending up getting turned around into the sharp rally. That is not a partisan statement intended to disparage the President. It was just that an ineffective highly, partisan split Congress with a President who got only the slightest majority of the popular vote was going to be problematic. That’s a prescription for a higher risk of actually heading over the Fiscal Cliff in January. At the very least, this is left us with a level of uncertainty that has created highly volatile, low liquidity markets. That was one of the main topics of discussion when I cohosted Jack Bouroudjian’s Jack B. Show today, extending into the still less than constructive influence out of Europe. Thanks to Jack for exploring all that. The weekly Report & Event Summary Perspective is available through the link in the right hand column. The Technical Projections and Select Comments from last week are also available and still relevant… with the notable exception of the critical equities decision explored in the General Market Observations and EXTENDED TREND IMPLICATIONS below. This is one of those weeks that saw equities benefit from the combined influence of the now well-established central-bank support along with somewhat better data. As it typically takes a couple of quarters for the central-bank actions to impact the various economies, it leads one to wonder whether the central bank actions were really all that necessary. However, in this case we must allow that the anticipation of worse things to come is enough of a psychological drag to justify at least some of the central-bank largesse. What is most interesting is not that the central bank and supra-national actions have created a ‘risk on’ psychology, but more so how little is being done about the underlying problems which caused the central banks to feel their massive involvement was necessary in the first place. 2012/10/16: Quick Post: Weekly Calendar and CRITICAL Equities turn!! The weekly Report & Event Calendar is available through the link in the right hand column. The Technical Projections and Select Comments from early last week are also available and still relevant… with the notable exception of the critical equities decision explored in the General Market Observations below. Those will also be reviewed at greater length that includes the other asset classes in this week’s Summary Perspective on Key Influences that will be posted later this evening. We hope you find that useful as well. This is one of those weeks that actually began before it began, including some important Chinese economic data over the weekend that was noted in the calendar. However, also noted in the calendar was the far more important IMF and World Bank Group meetings over the weekend. That provided the real sense of comfort on the European situation that is so prominent in the sharp improvement of the equities market from the very top of this week. And in spite of all the interesting news yet to come that includes more Chinese data on Thursday, it looks like a significant decision to reflect a renewed ‘risk on’ mentality has already been taken by the equities.